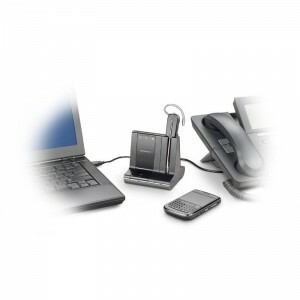 Plantronics Savi W740 wireless headset for your desk phone, mobile and PC. The Plantronics Savi W740 is the latest product to be announced by Plantronics which is changing the way productivity-focused office professionals communicate. With multi-connectivity, a newly designed convertible headset, and up to 350 feet of wireless range, the Plantronics Savi W740 can easily manage desk phone, PC and mobile calls with the most intelligent wireless headset system on the market. No longer will you need to have three headsets at your desk and constantly juggle between headsets for different applications. With the Plantronics Savi W740 you put on one headset and you’re done. You’ve instantly connected to your standard office phone, your mobile or cellular phone and your computer for VoIP and unified communications. You’re also getting top of the line quality and performance with the Plantronics W740 wireless headset. It’s the lightest headset on the professional market weighing only 21 grams and will give you unlimited talk time with the purchase of an additional battery that can be hot swapped during a call. This is the first headset with the hot swappable battery in the headset industry.